Sale Fell is a pleasant fell on the northern edge of the Lakes, sitting on the north-western shores of Bassenthwaite Lake. It forms the entire northern wall of the tiny Wythop Valley, a hidden valley that ends above Bassenthwaite, but that is unseen and unsuspected from the east. Although the name is normally used for the entire block of high ground between the Vale of Embleton, Bassenthwaite and the quiet Wythop Valley, Sale Fell is actually the name of the western part of this hill. From below the fell appears to have a fairly simple shape, but the upper parts of the fell actually form a horseshoe of small summits, surrounding the upper reaches of Routen Beck. Sale Fell is at the western end of this loop, with Rivings to the south and Lothwaite to the east. A third nameless summit is now lost within forestry. Lothwaite is well worth a visit as it provides the better views east and south-east. Sale Fell is an unobtrusive summit from most directions, but it does present an attractive face to drives heading east on the A66, who see its steep northern slopes, lines with paths and partly tree lined. Geographically Sale Fell feels like something of a full stop, sitting at the north-eastern corner of the block of fells north of Whinlatter Pass. There is more high ground between the Vale of Embleton and the River Derwent, but this has a different character (more rolling hills than fells) and the highest point, on Setmurthy Common, is 100m lower than Sale Fell. It is possible to part at Brumston Bridge, on the northern of the two roads into the Wythop Valley. From here a track leads towards the old church ruins - follow it until a second path branches back and up across the fell, then near the top of the climb look for a path that heads right towards the summit. From the north the key is two rights of way that leave the road near the new church and join on the fell. At this point you can either turn left or right. Left brings us up the valley of Routen Beck as far as a stone wall, then turn right again to follow the wall. This will bring you to the path that links the various summits - turn right for Sale Fell or left for Rivings. Right brings us to the same ridge as the Wythop route - turn left onto the path that runs behind Sale Fell to the summit. We have a walk on Sale Fell starting from Brumston Bridge and visiting the three named summits. Wythop Beck forms the southern and western boundaries of the fell. It is fed by a network of streams in the Wythop Valley which come together near the church ruins. The combined beck flows west through the narrow entrance to the valley, then north through Wythop Mill. This puts it east of the watershed in the Vale of Embleton, and the beck combines with streams coming off Ling Fell to form Dubwath Beck, which flows east into Bassenthwaite. There are two becks that form on the highest slopes of the fell. 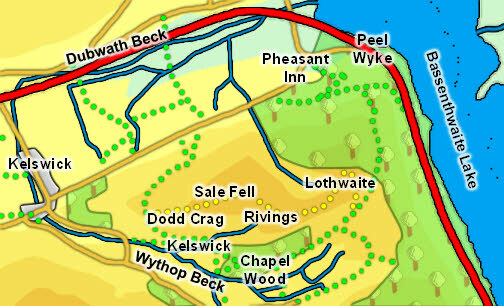 A nameless beck rises south of the summit and flows west past Kelswick to flow into Wythop Beck south of Dodd Crag. In the north Routen Beck (here we take the name from the small community of Routenbeck) forms in the heart of the fell, flows north into the flat valley bottom (where it feeds a wetlands reserve) then turns east, to merge with Dubwath Beck just short of the lake. Sale Fell has no tarns. On the southern slopes are the ruins of Wythop Old Church. The new church is on the northern side of the fell, on the road between Routenbeck and Wythop Mill, in a site that falls outside the Wythop Valley, but presumably was chosen to serve the scattered communities north of Sale Fell.